« A little bit of exitement! Glasgow, like many cities, owes its existence to the river which flows through it and the fact that in historical times it was a convenient crossing point of that river. In those days the Clyde was not a deep navigable river up to Glasgow, but was the last place where a bridge could be built to allow a crossing without a boat. There was a salmon fishing hamlet at Glasgow (which probably gets its name from the Celtic glas and cu meaning “dear green place” ) when St Mungo established a monastery on the banks of the Molendinar Burn, a tributary of the Clyde, in the 6th century. 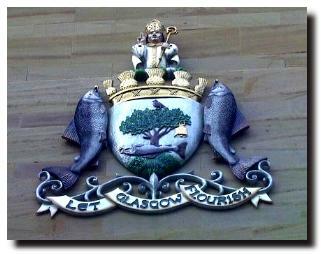 Somewhat surprisingly, the City of Glasgow did not have a coat of arms until the middle of the 19th century. In 1866, the Lord Lyon King at Arms gave approval for one which incorporated a number of symbols and emblems which had been used on official seals up until then – all of which were associated with St Mungo. St Mungo (who was named originally Kentigern) is said to have preached the sermon containing the words “Lord, let Glasgow Flourish by the preaching of the word.” The thrusting Victorian city truncated its motto into the more secular “Let Glasgow Flourish” which is still in use today. There’s the bell that never rang. The tree in the coat of arms is a now sturdy oak tree, but it started out as a branch of a hazel tree. The legend says that St Mungo was in charge of a holy fire in St Serf’s Monastery and fell asleep. Some boys who were envious of his favoured position with St Serf put out the fire. But St Mungo broke off some frozen branches from a hazel tree and, by praying over them, caused them to burst into flames. This commemorates a wild robin which was tamed by St Serf and which was accidentally killed. St Mungo was blamed for the death but he is said to have taken the dead bird, prayed over it and it was restored to life. The coat of arms always shows the fish with a ring held in its mouth. This is because a King of Strathclyde had given his wife a ring as a present. But the Queen gave it to a knight who promptly lost it. Some versions of the story say that the King took the ring while the knight was asleep and threw it in the river. The King then demanded to see the ring – threatening death to the Queen if she could not do so. The knight confessed to St Mungo who sent a monk to catch a fish in the river Clyde. When this was brought back (presumably catching salmon in the Clyde in those days was a lot easier then!) St Mungo cut open the fish and found the ring. When the Bishop of Glasgow was designing his own seal around 1271, he used the illustration of a salmon with a fish in its mouth and this has come down to us in today’s coat of arms. The illustration here is of an ornate lamppost, incorporating all the symbols of the coat of arms. It is located near Glasgow Cathedral – founded nearly 1500 years ago by St Mungo. Steeple of Tron churchIn 1450, John Stewart, the first Lord Provost of Glasgow, left an endowment so that a “St Mungo’s Bell” could be made and tolled throughout the city so that the citizens would pray for his soul. The bell was still ringing out in 1578, as there is an entry in the City Treasurer’s accounts two shillings (10p) “for one tong to St Mungowis Bell.” A new bell was purchased by the magistrates in 1641 and that bell is on display in the People’s Palace museum near Glasgow Green. In 1631, another bell was made, this time for the Tron Church (the steeple is pictured on the right), on which was inscribed the words “Lord, let Glasgow Flourish by the preaching of the word.” Whether Glasgow flourished with spiritual assistance or the hard work of its people (or both), there is no doubt that Glasgow, now the largest city in Scotland, (twice the size of the capital, Edinburgh ) has certainly prospered.